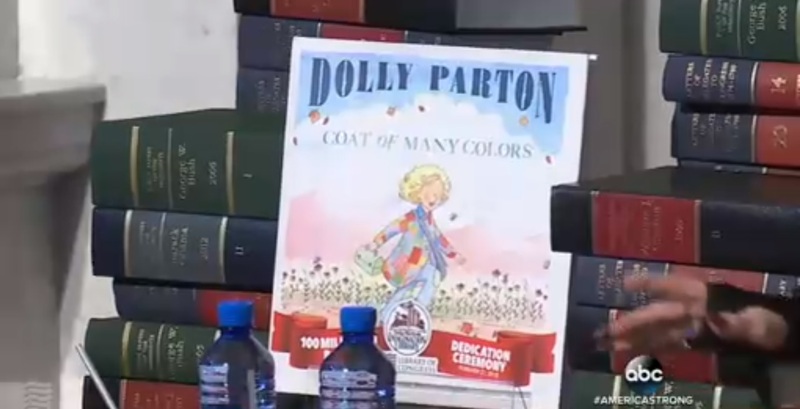 Dolly Parton has been called a lot of things in her life; actress, singer, songwriter, but the one she values most is “book lady.” She celebrated this title at the Library of Congress on Tuesday. Founder of the Imagination Library, Dolly Parton donated her 100 millionth book to the Library of Congress. It was an amazing event attended by preschoolers, parents and news media. The songwriter has been donating a book-a-month to children since the beginning of her nonprofit program. What a wonderful idea she came up with, and people around the country seem to love it as well. Growing up as one of twelve children, she mentioned that the person who got joy out of her being a book lady was her dad. Patron explained that Robert Lee Parton Sr., who died in 2000, never attended school and couldn’t read or write. She grew up with only the Bible in their home, which is what prompted the songwriter to start the Imagination Library. One of her famous songs “The Coat of Many Colors” was turned into a book. This was to be her 100 millionth book donated to the Library of Congress. The inspiration for that song was a coat that her mother had made her as a child. It was crafted from rags but she cherished it anyways. She wanted to donate this book, with one stipulation, that she read it during a live video. “Yesterday when we put the book in the Library of Congress — I really felt like mom and daddy was just up there looking down thinking, ‘You go.’ So I felt really proud that I could honor momma and daddy,” Parton said. Congratulations go to Dolly Parton for this milestone of her career. The Imagination Library has helped families throughout the US. Their children get the gift of books to read because of her generous donations. As part of the Imagination Library, parents can sign their children up and get a book a month. One of the biggest joys Parton has gotten is letters from children. They express their gratitude and sadness after they “graduate.” Thank you, Dolly Parton, for giving the world’s children a better chance at learning to read.